One last wood fact: redwood expands and contracts longitudinally rather than cross grain. Don’t know why but has to be allowed for when using it. I know this has gotten a little side tracked, but, I figure there may be some out there who have little to no experience with actual solid wood and it's seasonal movements. I figured this may, (or not), help someone. I put Pergo ("manufactured wood") in my Allegro. It's held up really well with the wild swings in temperature and humidity. It's not heated in the winter or cooled in the summer 99.999% of the time. Except for some scrapes from sliding chairs around, it looks like the day I installed it. Yup...one if the joys of true hardwood flooring. I've installed a bunch, still my favorite flooring. Don't have any experience with Redwood. Wish I did. No matter what, solid wood has a look that nothing else can fully replicate, but, like all things, isn't perfect to work with. As long as considerations are taken for what the wood is going to do, it's all good! Congrats on the Pergo. As long as you're happy, that's all that matters! As far as sticky doors go, I normally trim mine when they get sticky, which around here is summer time, just to eliminate it, and then we're good to go for the rest of the year. It's easier to add weather stripping, if needed, than to deal with sticky doors. 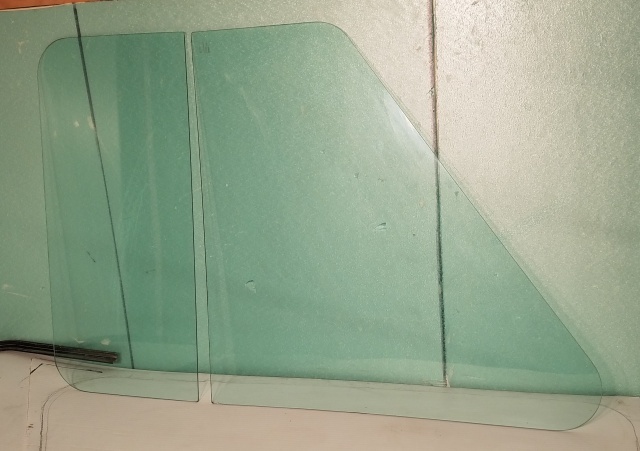 Moving on, here is a pic of one of the 2 pieces of glass next to the copilots window. Both of them had a coating of window tint film applied on the inside. The film was not in the best of shape, so I prepared to remove it. Then of course, we have to have an after picture. That was a lot of fun, or not. Lol. Had to use a razor blade to get the film off. Some of it would come off in a sheet, but most of it had to be scraped off. Back to the window frame, we have a close up of the window frame with the rubber. 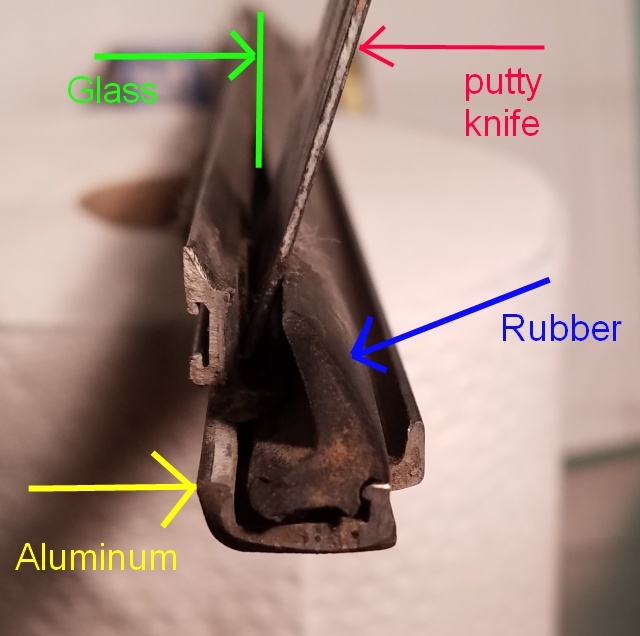 The picture is labeled, with the glass sliding between the rubber gasket and then glued to the aluminum framing. Obviously, the rubber gasket slides out, and is a replaceable part. Just in case you need to know how older windows were put together. Yours may be different, but this is what mine look like. I bought more ChemLink M-1, but only 3 tubes and this time it was black, instead of white. I think I'll be using that for the windows instead of the white stuff. As such, I need to update the spreadsheet. former total was, $6685.02. 3 tubes @ %7.50 per tube, plus tax cost $23.85, so our new grand total amounts to $6708.87.